All Praise is due Allah, Lord of the worlds, and may the peace and blessings be upon the Messenger of Allah. 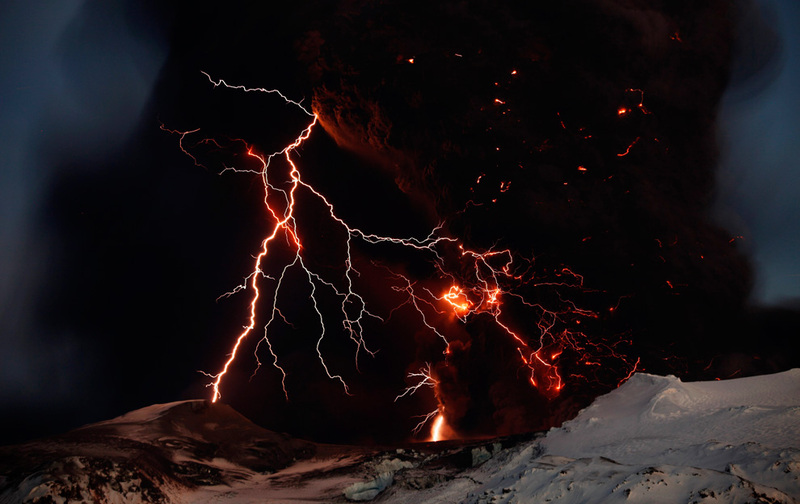 From a small, remote island nation located in the North Atlantic Ocean, a small, sub-glacial volcano erupted, sending plumes of ash thousands of feet into the air. It drove the entire European continent into panic and caused the disruption of international flights around the world. Airplanes discontinued flying, airports shut down, and air traffic was suspended. 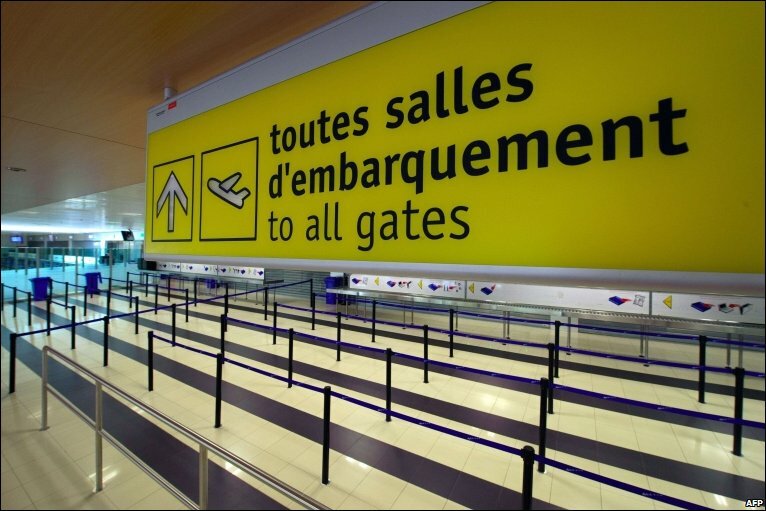 In 2010,One-hundred thirteen European airports closed their airspaces in the face of international navigation. More than 63,000 flights were cancelled. The airline industry faced losses of up to $250 million per day. Over seven million travelers were stranded. Airport lounges turned into dormitories, and passengers were provided with blankets and other necessities. In addition, importers and exporters were confronted with deficits. Europe was nearly isolated from the world when it met the biggest disruption of air transportation in its history. One cloud of volcanic ash sent an entire continent into panic and fear and paralyzes air travel. What would happen if several volcanoes erupted? Indeed, it is an event that calls upon us to think, reflect, and contemplate. It is not fit for such great happenings to surpass a Muslim without a deep, thoughtful pause that comes about from his/her faith in Allah, with full certainty, that whatever good happens in this universe is from the grace and mercy of Allah and whatever evil happens in it is with His knowledge. Allah has wisdom behind everything He wills and decrees. Volcanoes and the like are soldiers of Allah; He sends them upon whom He wishes of His servants, in the time He wishes, in the manner He wishes. They are a warning, a trial, and a punishment. Among the soldiers of Allah is the volcanic ash, composed of small particles of glass and pulverized rock. The ash poses great danger to aircraft engines and instruments and thus hinders planes' movement. Moreover, it may pose serious health hazards if inhaled. To simply say that such incidents are "natural" occurrences due only to standard universal laws illustrates one's heedlessness of the Creator and the Controller of this universe. For who runs and manages this universe in such an orderly fashion and gives it power to strike its inhabitants? 3. And this is nothing else than a reminder to mankind (74:31). 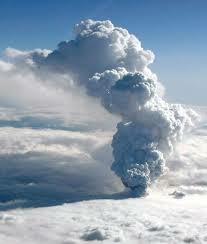 The volcanic ash cloud is a sign among the signs of Allah. It was sent to His slaves as an admonition and reminder to the Believers, and a way to warn and frighten those who turned away from Him. The believing heart will take heed and turn to its Lord in repentance, while the oblivious heart that has forgotten its Lord will only worry about economic losses and the latest updates. It is from the hardness of the heart that one hears of such adversities and yet fails to detach themselves from sin and transgression and continues to follow their desires. Similarly, during the solar eclipse he experienced (salallahu alayhe wa sallam), he came out in a restless state thinking the Hour had begun. This is indicative of the degree to which he feared the Hour and kept it in his mind. 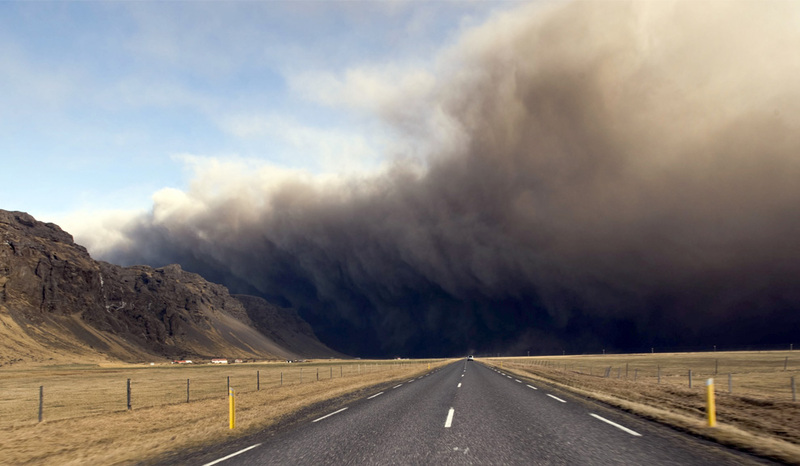 What should our state be when we witness an ash cloud shooting up 10km into the air? What hit Europe and affected the entire world is a great indicator of the power and strength of Allah, glorified be His Majesty. His decree outstrips all other commands and His might leaves all other helpless. Whatever Allah wills happens and whatever He does not will does not happen, and He is over all things competent. When man becomes arrogant, transgresses, claims perfection and self-sufficiency, Allah sends signs that remind man of his weakness and need of his Creator (the Exalted). It was a matter of minutes before security turned into fear and profit into deficit. Did the power, technology, money, research, and innovations of these "First World" countries benefit them in the face of one of the soldiers of Allah? They helplessly watched and gazed as the order of Allah moved before their very eyes. 6. There is no refuge from Allah except in Him (9:118). 7. A fire that reminds of a greater Fire. 8. And no soul perceives what it will earn tomorrow (31:34). Conferences organized, meetings arranged, appointments set, reservations confirmed, hotels booked, and holidays planned; but no person knows what he will earn tomorrow. It was one eruption and many cancellations. Travelers were fighting over seats to get back home. 9. And whatever strikes you of disaster – it is for what your hands have earned; but He pardons much (42:30). This is the way of Allah; He decrees calamities to scare His slaves. When sins, oppression, killings, and indecency multiply, so do volcanoes, hurricanes, floods, earthquakes, droughts, diseases, wars, and losses of life and wealth. While airline businesses faced shortfall, transportation services by train, bus, and ferry were thriving as passengers looked for alternatives. In addition, there was a high demand for hotel rooms. All praise is due to the One who allocates provision to whom He wills! Some people suffer bitter losses and other people celebrate unexpected gains! Observing exhausted travelers sleeping on uncomfortable chairs, impatiently waiting days and nights, should lead us to acknowledge the great and innumerable blessings Allah has bestowed on us. The blessings of security, peaceful nights, and tranquil days ought to fill our hearts with the praise of Allah and our tongues with thankfulness to Allah. Moreover, this particular incident reveals to us our reliance on airplanes and the blessing of arriving at far distances in a short span of time. Allah mentions she-camels in the Quran because they were prized wealth to the Arabs just as airplanes are valued to us today. We ask Allah subhana wa ta'ala to have mercy on us, forgive us our sins, and through these signs, guide those who have gone astray to the Straight Path. Indeed, Allah is Subtle and Acquainted. What a perfectly matched couple….This marriage was indeed prepared in Jannah(heaven)….Its like a page from a fairytale…These were just some of the comments made after Yusuf and Fatima's nikaah (wedding) ceremony. A few years later and two Masha-Allah beautiful kids in their spacious home, "the sea was no longer so clam"…Like many other marriages, Yusuf and Fatima's marriage seemed to be experiencing some turmoil. Both were sincere and not a night passed when they would go to bed without making peace and amends. Fatima comes to her husband Yusuf with a proposal: "I read in a magazine, a while ago, about how we can strengthen our marriage." She smilingly and lovingly offered. "I'll start," offered Fatima. She took out her list. It had many items on it. Enough to fill 3 pages, in fact. As she started reading the list of the little annoyances, she noticed that tears were starting to appear in Yusuf's eyes. "What's wrong?" she asked. "Nothing" Yusuf replied, "keep reading your list." Fatima continued to read and tears flowed now more profusely from Yusuf's eyes and began to wet his beard. Fatima somewhat nervous read all three pages to her husband. She neatly placed her list on the table and folded her hands over the top of it. Quietly Yusuf stated, "I don't have anything on my list. I think that you are perfect the way that you are. I don't want you to change anything for me. You are lovely and wonderful and I wouldn't want to try and change anything about you." Lesson: This is not to say that you must overlook every fault in your partner. If a marriage partner is abusive, or is an alcoholic or drug addict, or is unfaithful, or something of that nature then yes of course there must be changes. But when it comes to the little things, remember that we are all imperfect beings, struggling to worship our Creator Allah as best we can, pursue our dreams in a Islamic way, raise our families, put food on the table, and balance all of the above fairly. We all have faults. We all make mistakes. If you go looking for faults in your partner you will find plenty and that is for sure! You will find many mistakes, bad habits, and imperfections. If you focus on your partner's imperfections you will never be happy. You will always be dissatisfied, wanting more, feeling deprived, feeling frustrated. And you will end up making your partner miserable, and pushing your marriage into misery. Instead, look for what is good in your partner. See his/her beauty, good habits, loving or kind gestures, relationship with the Creator Allah, hidden potential, and Islamic aspirations. If you look for beauty you will find it. Nurture that beauty by appreciating it, and it will grow. The love between you will deepen like a strong river, becoming more and more powerful over time. And those little things that used to bother you so much will seem not very important at all. Allah, Most High, has given us innumerable favours and He has declared: "And if you were to count Allah's favors, you would not be able to number them; most surely Allah is Forgiving, Merciful. "(Holy Qur'an 16:18). Allah is pleased with those who are thankful to Him. He increases His favours which become the means of comfort and respect in your marital home. If one fails to offer gratitude and reconcile our "petty" differences, then such an attitude surely amounts to disregard for the so many favours Allah has blessed us with. Therefore Allah says: "If you give thanks, I will give you more: but if you are thankless, lo! my punishment is severe." (Holy Qur'an 14:7). "Among those who came before you was a man who killed 99 people. He then asked to be guided to the most prolific worshipper from the inhabitants of the earth, and he was directed to a monk. He went to him and told him that he had killed 99 people, and he asked whether it was possible for him to repent. The monk said, 'No.' The man killed him, thus making him the 100th victim. He then asked to be directed to the most knowledgeable of the Earth's inhabitants, and he was guided to a scholar. He went to him and told him that he had killed 100 people, and he asked whether it was possible for him to repent. The scholar said, 'Yes, and who will stand between you and repentance. Go to such and such land, for in it dwell a people who worship Allah, so go and worship Allah with them. And do not return to your land, for it is indeed a land of evil.' He left, and when he reached the halfway point of his journey, he died. The angels of Mercy and the angels of Punishment disputed with one another [in regard to his case]. The angels of Mercy said, 'He came to us repentant, advancing with his heart towards Allah.' The angels of Punishment said, 'Indeed, he never performed any good deeds.' Then an angel came in the form of a human being, and both groups of angels asked him to be the judge between them. He said, 'Measure the distance between the two lands. Whichever land he is closer to is the land that he is closer to [in terms of being of its people]. They then measured the distance and found that he was closer to the land that he was heading towards, and so it was the angels of Mercy who then took his soul." Several years ago a Sheik recounted what happened to him after he had moved to London. He often took the bus from his home to the downtown area. Some weeks after he arrived, he had the occasion to ride the same bus. When he sat down, he discovered that the driver had accidentally given him a twenty pence ('tuppence') too much change. As he considered what to do, he thought to himself, you better give the twenty pence back. It would be wrong to keep it. Then he thought, "Oh, forget it, its only tuppence. Who would worry about this little amount? Anyway the bus company already gets too much fare; they will never miss it." Just than the verse of the Qur'an flashed through his mind like a lightning… "O you who believe! Fear Allah and be with those who are truthful." (Qur'an-9:119). When his stop came, the Sheik paused momentarily at the door, then he handed the twenty pence back to the driver and said, "Here, you gave me too much change". The driver with a smile, replied," Aren't you the new Imam in this area? I have been thinking lately about accepting Islam and going to worship at your Mosque. I just wanted to see what you would do, if I gave you too much change." When the Sheik stepped off the bus, his knees became weak and soft, he had to grab the nearest light pole and held on for support, and looked up to the heavens and cried, "Oh Allah, I almost sold You and Islam for twenty pence!" Aisha [Allah be pleased]the Blessed Prophets wife, was a very hospitable person. She loved to entertain guests, and spend happy hours chatting to them. Once a woman came to visit Aishah[RA], bringing her two daughters with her. Aishah received her, smiling and welcoming and very soon the two women were deep in conversation. However, Aishah was faced with a certain difficulty..
A mother is so precious and dear. That Mother's Day should be celebrated EveryDay! "Jannah[Heaven] lies under the feet of your mother" (Hadith-Ahmad, Nasai). Although honouring and respecting one's parents is incumbent upon Muslims, care should be taken that it is not done in an unislamic way. Our dear and beloved Mother is to precious to be honoured Only Once a Year on Mother's Day. Particular care should be taken to honour this great lady Every Day! The ties of kinship are very important in Islam, with emphasis given to the relationship between children and parents. Children are required to respect and obey their parents unless doing so involves a sin. Furthermore, adult children must continue to honour, respect and show gratitude to their elderly parents, and are expected to care for and support them. In the event the parent has passed away, children should make dua(pray) for them, give charity on their behalf(e.g. sponsoring a well etc) , perform Haj and Umrah on their behalf and treat their friends in a kind manner. Ø Abu Hurayrah (may Allah be pleased with him) narrated :"A man came to the Messenger of Allah (peace and blessings of Allah be upon him) and said: 'O Messenger of Allah, who among the people is most deserving of my good company?' He said, 'Your mother.' He asked, 'Then who?' He said, 'Your mother.' He asked, 'Then who?' He said, 'Your mother.' He asked, 'Then who?' He said, 'Then your father.'" (al-Bukhaari and Muslim). Ø Abu Usaid Saidi said: We were once sitting with Rasulullah when a man from the tribe of Salmah came and said to him: O Messenger of Allah! do my parents have rights over me even after they have died? And Rasulullah said: Yes. You must pray to Allah to bless them with His Forgiveness and Mercy, fulfill the promises they made to anyone, and respect their relations and their friends (Abu Dawud and Ibn Majah). Ø It is narrated by Asma bint Abu Bakr that during the treaty of Hudaibiyah, her mother, who was then pagan, came to see her from Makkah. Asma informed the Messenger of Allah of her arrival and also that she needed help. He said: Be good to your mother (Bukhari, Muslim). Islamic Scholars are unanimous that celebrating Mother's Day does not have it basis or origins in Islam. In fact it has its origins in Non- Muslim culture and today it is being promoted mainly due to commercial purposes. Therefore mother's should be loved, respected, obeyed and appreciated every day, with no need to single out special days to honour them. Muslims already observe three established holidays (eids) in Islam: Eid al-Fitr, Eid al-Adha, and the weekly Jumu'ah eid. The Prophet Muhammad (peace be upon him) warned Muslims not to add or remove anything from their religion, saying: "If somebody tries to introduce into this faith of ours (Islam) something which is not a part of it, it is to be rejected and that person is condemned." (al-Bukhaari and Muslim)Therefore, Muslims should be satisfied with their faith and avoid the traditions and holidays of non-Muslims, including Mother's Day and Father's Day. While the intention of honoring parents is good, Muslims should be honoring their parents each and every day, and not limiting that level of respect and affection to a single day each year. We thus can conclude that Islam has emphasized on respecting and honouring mothers, as is evident from the Quran and Hadith. We are not only required to honour mothers during their life time, rather after their demise as well. May Allah Ta'ala grant us all the tawfeeq to fulfill the rights of our mothers and be recipients of their dua's not once a year but EVERY DAY!, Amin. "Can you believe this!" lamented Yusuf as he looked sadly at his leg covered from foot to knee in a thick white plaster cast leaving his plaster stained toes exposed. "This is soo frustrating!" he continued, addressing his exposed toes who had now become his captive audience, "Just when everything was going perfectly. Now this! Like I needed it in my life?" "Did you hear what I said? I really didn't need this in my life. Not at any time, and definitely, definitely not now. I mean..."
"What's so special about now?" enquired Ridwaan not bothering to look up from his cell phone. Yusuf ignored his question, shifted painfully in his chair and struggled to get his leg into a comfortable position. He stared at some of the graffiti on his plaster cast "Mojo was here!" "Oops. My brain just hit a bad sector" "On the other hand, you have different fingers" and some other writings that became a bit smudgy with the first attempt at taking a shower. "I mean how does someone rupture an Achilles tendon playing tennis? It must be a one in a million thing, and I am the one! So now I sit – six weeks with this thing on my leg. Six weeks! and at a time when the business is going so well. Just when we got the Department of Education tender for printing. There's so much to do .... preparation, layout, design. Yo! It was going crazy at work." Ridwaan stopped fidgeting with his cell phone long enough to exclaim, "So what's the hassle. You get a nice break and fully paid on top of it!" "You don't understand, do you!" said Yusuf, glaring at him. An uncomfortable frown crossed his forehead, "You don't know what it means. I really didn't even have enough time to eat let alone take a six week break. We were working 12 hours a day to get that tender out. So what happens now?" "I know exactly what it means," replied Ridwaan, "It means you were moving too fast so Allah put down a speed breaker"
"What!" he exclaimed, "What you mean...speed breaker?" "You see, sometimes when we rush through life and we forget the important things then Allah puts down a speed bump so we can slow down and reflect. Maybe a little sickness or a small problem. Just to ponder on what we're doing and what we should be doing. And that's it! You were chasing like a madman so you got hit with a speed bump." He paused allowing his words to sink in then continued, "You know most of us get so caught up in life then we forget about Allah, our salaah becomes just a ritual and the family ...well, they even forget who we are. I bet your kids call you Uncle by now?" "Hey, it's not that bad," said Yusuf struggling to find a comfortable position for his plastered leg, "But I hear what you saying. Things were getting a bit out of hand. I missed my daughter's sports, dropped a couple of salaahs on the way and jip, Allah knows what else I gave up for this tender...."
Yusuf fell silent pondering on his situation, a thin smile broke on his lips and his face lit up with this new found understanding, "So this wasn't all bad then. Actually...."
"It was for you own good," Ridwaan completed the sentence for him, "Too often we forget the real things in life...our Allah, our Deen, our families and those so called little things we tend to forget." "Yup," chorused Yusuf, "I remember a clever guy telling me once, pay attention to the little things in life, for one day you may find out they were actually the big things. Really can't believe Allah's mercy and kindness upon us. It is, as they say, more than that of a mother. He cares for us and even what I thought was a horrible misfortune was actually an act of kindness from Him." Death should be a daily reminder for us all. We do not know if today will be our last day in this world. Allah subhanahu wa ta`ala (exalted is He) said, "Every soul shall taste death." Everyone's time of death is written and only Allah (swt) alone knows when we will take our last breath. Pray for the deceased and their family. When receiving news of death, recite: "To Allah (swt) we belong and to Him we shall return!" Pray for the deceased, asking Allah to grant them the highest level of Paradise. Pray that their grave is filled with noor (light) and the fragrance of Jannah (paradise), and to show them their place in Jannah. Pray they are resting peacefully in their graves, and that Allah eases the pain and suffering of the loved ones left behind. Visit the relatives of the deceased. Contrary to un-Islamic cultural and superstitious beliefs, speaking or associating with the relatives of the deceased will not unleash a death curse on you or your family. Prophet Muhammad [pbuh]visited the families and friends of the deceased. Express kindness in your words. Refrain from making inappropriate comments such as: "Thankfully, s/he was not married," or "Was it your fault?" or "How will you survive without your child/sibling/spouse/parent?" Remember, there will be many people who die single, or married, or with children; in youth and in old age; in sickness, in health, in accidents and even by murder. The kindest Muslims are those who ease the pain and suffering of others, as the reward for such actions comes from Allah. Blaming others for causing the death of a loved one will not bring the deceased back to life. Only Allah knows why it was his/her time of death; blaming others will only cause guilt and anxiety. Provide help and take action. Simple acts such as providing assistance or bringing food, or inviting them to your home, will be much appreciated as the family members often neglect themselves while grieving. Be among those Muslims who are caring and kind to others, especially during times of sadness. Often, the families of the deceased are embarrassed to ask for help, or just want to talk; offer your help. Be sensitive and humble. Now is the not the time to suggest a marriage partner, gossip, or talk about your own happiness. Even making remarks such as, "It is time for you to move on," or "At least you are so thin despite your loss," or "How much did you score from the inheritance?" is simply rude. It is also disrespectful to dress up as if you are celebrating a holiday while visiting the homes of the grieving families. One cannot imagine what the suffering individual is feeling, so just being there to show your support is better than saying something you will regret.